My new shoes, Amanda was my inspiration but my friend Chris is always watching my back!! They are made by a company called "Big Buddah" and I love them. Thanks Chris! Converse "Chucks" and all time favorite and I own seriously every color!! Love these things! Shoes I wore in my 20's but secretly would wear them again, if my poor feet would allow it! I admit it! I am a shoe addict. I love all and every pair of shoes!! I worked for Nordstroms for a lot of worked for this company for several years and seriously came home with at least one pair of shoes every month. In my early 20's it was the pointy toe pump. The more toe cleavage it showed the better the shoe. I'll admit with age those are no longer happening. I probably couldn't even walk across the room with them on. The other night Amanda from the Quilted Fish was in the shop and had the cutest shoes on, of course Shelby and I went nuts over them. so, my friend Chris was out and about and calls me and say " I found those shoes and they have your size, do you want me to pick them up? UHHHH, hello, yes, of course I want you to pick them up. So, my darling friend picks them up and brings them to the shop!! 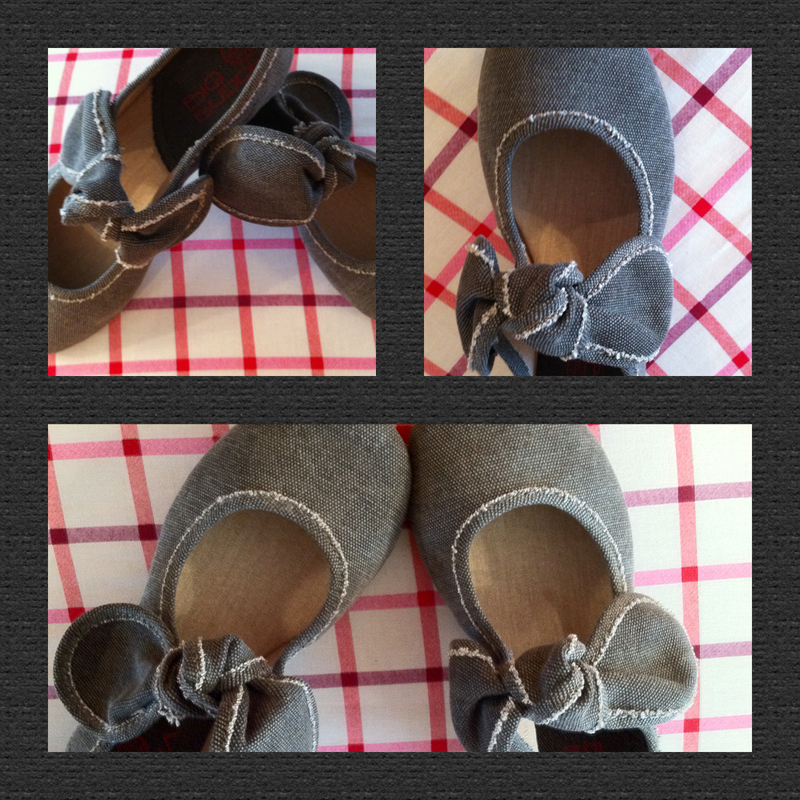 Ta Dah, look how cute!!! Whats your favorite shoe? Secretly, I am still that skinny girl that looks hot in those pointy toe pumps, but of course a girl can dream can't she!! So now you know my fetish with shoes. 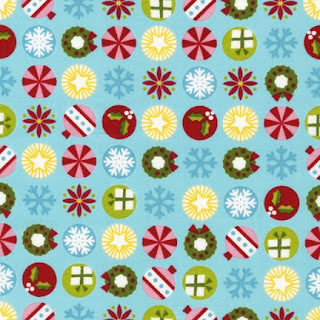 I heart this new line of fabric by Joel Dewberry. It's called Heirloom (Free Spirit) It has been a hot item at the shop! We have the entire line in and we are all going nuts over it! My favorite is the aqua & orange. Whats your favorite? I love that I am able to share my love of sewing with my daughter Shelby. She has a great eye for color and has even gotten a few of her friends to start sewing. She absolutely loves patterns from "Cluck Cluck Sew" She just made this quilt "Shortcake" for a friend who is leaving for college. 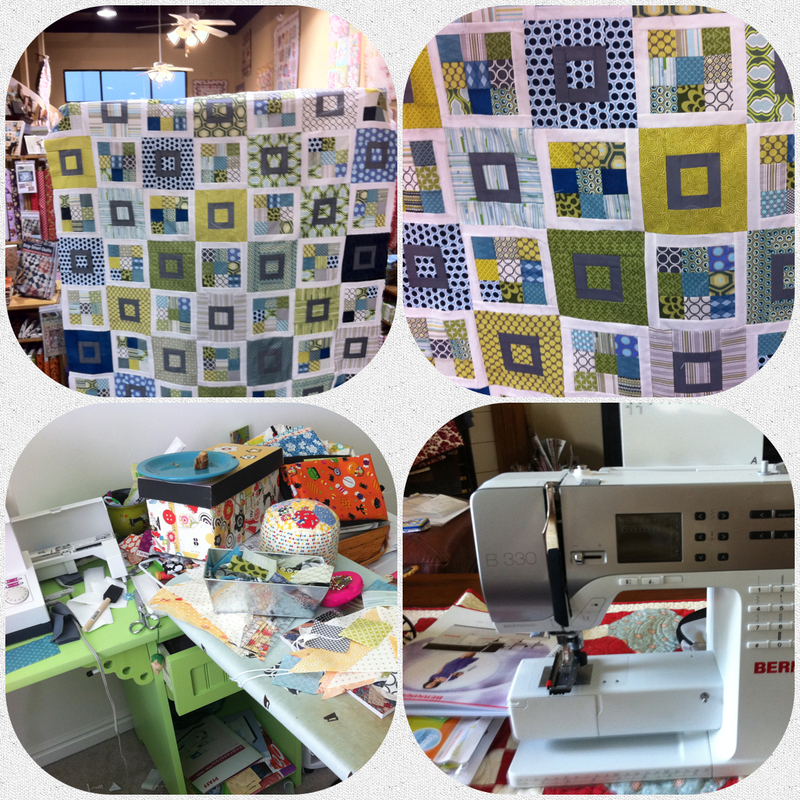 She has plans to make 2 more of the exact quilt just different colors, and 2 of her friends are making it also. Now for the downside of this, this is how she leaves my sewing room, even a piece of sandwich left for me. So, yesterday I decided she needed her own space and machine. This is her new machine and I will post pictures soon of her new space. I am not exaggerating when I say we have sewing stuff ALL OVER the house, just ask my son and hubby!! Well I am off to clean my space so I can sew! Love ya Shelby!! I really wouldn't have it any other way!! I'll admit it, it was totally an impulse buy! I have issues with the whole shopping thing, I love it! My hubby and I went to Target for date night. I know we are pretty awesome, huh? So, I can never go in anywhere with out going up and down each isle. 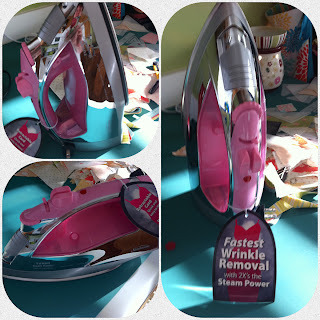 I am in the housewares isle and decide to look at irons, now I must admit I am a Rowenta gal, but the last few I have bought have not been great. I spy this little pink gem made by Sunbeam, oh and did I mention she is "Turbo Steam?" and I think "oh, she is coming home with me!" and for a whopping $34.99 she has a new home!! I love her!! What do you think? Isn't she cute? Mollie Makes a fantabulous new crafty publication! 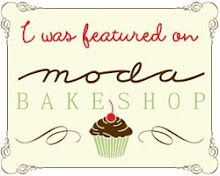 I am not sure if you have heard of this yet but I am here to tell you it is FANTABULOUS! 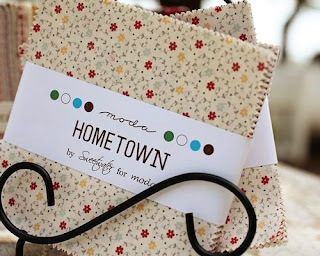 It is a UK publication called "Mollie Makes" for people who love the crafty life. It is chock full of beautiful photography, patterns, recipes and so much more. It makes me smile it is so happy! I got mine a few days ago but haven't had time to sit and drool over it yet. AHHH!!! but tonight my kids are gone and Tom is watching TV and me, well I am sitting here ohhing and ahhing over every page I turn. Its a must you get this! I have sent an email to see if we can get them at the shop, I'll keep you posted. Here are my blocks fro the Farmers Wife Quilt Along. This is block 1 through 16, I went in order so that I didn't get myself messed up. I am using Lecien fabrics from several different lines. I will post more pictures soon! 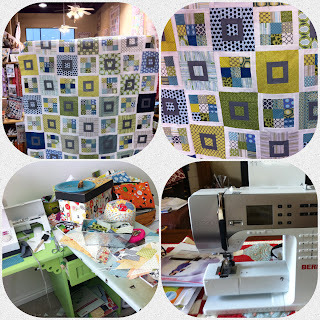 Have you jumped on the to this fun quilt along yet? I love to read!! I can curl up with a good book and sit all day and lose myself in whatever it is I am reading. House, laundry whatever...., it can wait. I will read anything, well, almost anything. I can't read self help books. I am already confused enough so I don't need someone physco-analyzing me. I admit it I am cuckoo. 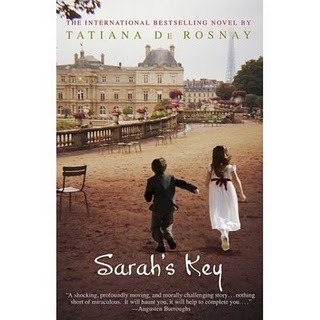 This book is by Tatiana De Rosnay and is an awesome read. I had today off and had a big to do list, I accomplished none of it. I sat here and read my book! If you are looking for a good Summer read, I strongly suggest trying this. What are you reading this Summer? Farmers Wife Quilt Along, and more!! the finished quilt from the book. This is so much fun!! I am not going to lie, I have dropped a few swear bombs in putting together a few of these blocks. 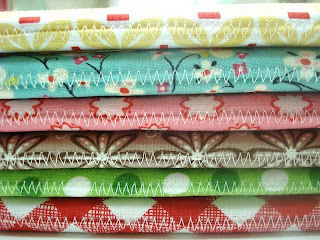 I met with Jeanine and Christy last night at the shop to work on a few blocks (which I will post pictures of tomorrow, I left my blocks at the shop) Jeanine's blocks are a mix of Heather Bailey and Amy Butler, Christy is doing darker colors, and I am doing Lecien's aqua's, reds, and ?? We laughed a lot, ate, and taught Christy some new quilty swear words good times! So, I have blocks 1-16 done, SURPRISE!! I have even shocked myself. 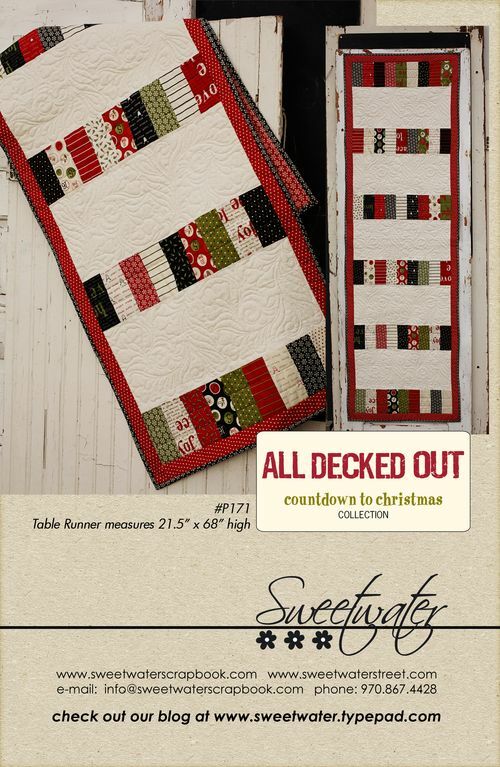 I haven't met a line of Sweetwater fabrics by Moda that I don't swoon over. 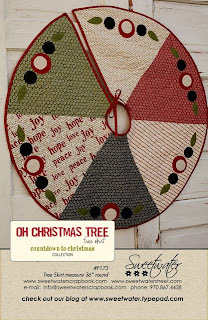 We have their new "Countdown to Christmas" line in ( yes, we do order the entire line and then some!) plus, all the pre-cuts. I loooove this line. 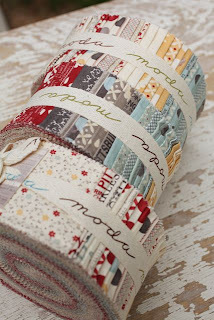 Then that wonderful man in brown delivered all the pre-cuts for their new line "Hometown" the yardage will be here soon. Yippeee!! I am making some serious progress on my "Twas the night" quilt. Its a pattern by Hugs n' Kisses and I love it. I kind of put it on the back burner but was trying to get it done today, I have one more row and the borders to go, piece of cake, right? I wanted to finish tonight but I have something going on and it will have to wait till tomorrow. I will be sure and post pictures after I get it quilted. 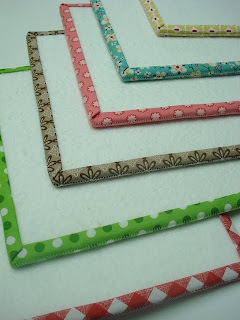 For those of you who are doing the "Farmers Wife Quilt Along" this is a super great tutorial from Bee in my Bonnet Who doesn't need a very cute design board. Lori, is in my 30's group "Yo Yo Mama's" and she always comes in to the shop with the cutest "stuff" pincushions, projects, purses you name she has it! She is amazingly talented!!! People who know her would totally agree. Her first line of fabric "Sew Cherry" is fabulous and oh, so Lori. She is the one responsible for my hexy addiction, my yo-yo yammerings, and I love her so!! So, hop over to her blog and tell her I sent you. You will fall in love with her and her blog!! Did you know that tomorrow July 11 (or 7-11) is the Slurpee's Birthday? Tomorrow you can get a free 7 oz. Slurpee at all 7-11 stores. I have to tell you that I love these things. I have a 7-11 right down from the shop and it calls my name frequently. I love to mix the flavors bananna and pina coloda, is probably my favorite. I have been known to hop from 7-11 to 7-11 looking for the flavor I am craving at the moment. Whats your favorite flavor? 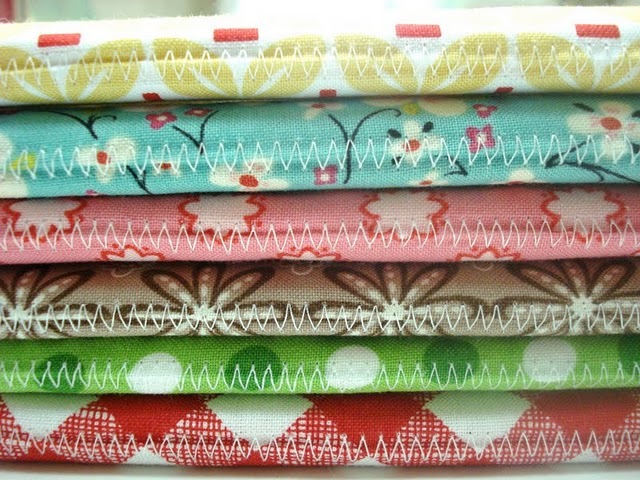 I am absolutely in love with the line Strawberry Fields by Fig Tree. I finally decided to jump on board and make something out of it instead of just ohhing and ahhhing over it all the time. I only have a gazillion projects going on right now but I thought I should add one more. I have it all cut out and will do a reveal later. We have the entire line at the shop and all the pre-cuts so if your feeling the love give us a call and we will ship it right out to you! Okay, I am pretty much obsessed with old doors and windows! I was out with my friend last week and we came upon a door that had been converted into a shelf like thingy. This place had the mother lode of doors. 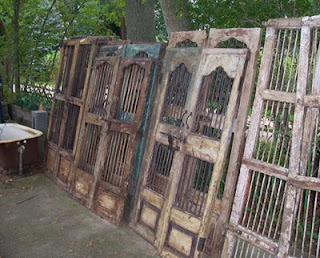 Of course we were in a smaller SUV and we couldn't fit it in the car, (believe my I begged) I have 3 old doors in the shop that I use for display and a few more in my garage. Pretty certain that if I ask my hubby to go for a drive up the canyon to get this door he will think I have lost my marbles. But I have a vision for this particular door. I know its mine!! I have been way into embroidery lately. 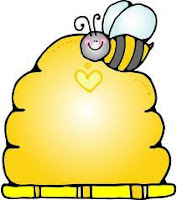 Right now I have 4 projects I am currently working on. I will be finishing up a couple of them this week and I will post pictures later. Helen from Hugs n' Kisses has tutorials for learning how to stitch on her blog. 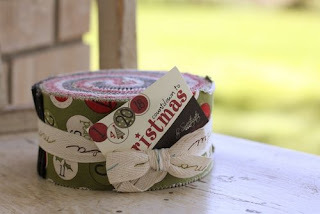 I love her style and have stitched several of her designs.Stitched Sunday is her new class that she is doing on her blog. Hop on over and tell her Nadine sent you!! 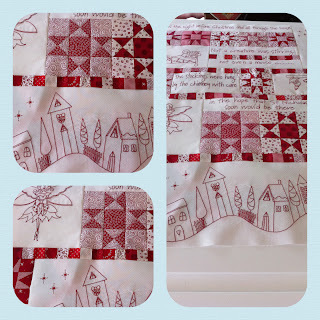 I am so excited to be following along in the Farmers Wife Quilt Along I am having a fun time. I have an extra book to giveaway to one lucky winner that has wanted to join in but hasn't. Here is all you have to do, become a follower of our blog by just clicking of the follow button on the right side of the page. Let us know you are going to start and a link to you blog so we can watch your progress! That is it! Easy Peasy. 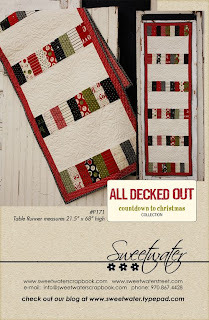 Then for all of you who have started I will sent you a bundle of fat eights perfect to get you going on this quilt, you must become a follower of our blog, and link us to your progress. That's it my friends So let Party!! *I will pick a winner on Wednesday July 6 so good luck! Wow, I finished the first 6 blocks of the "Farmer Wife Quilt Along" After Tweeting one night with Amanda, I think I am finally catching on to using templates. My color is really bright on my picture, I am actually using several of my favorite lines from Lecien. I am hoping to catch up and finish 6 more blocks by the end of this week. I am having so much fun!! Have you started yours yet? 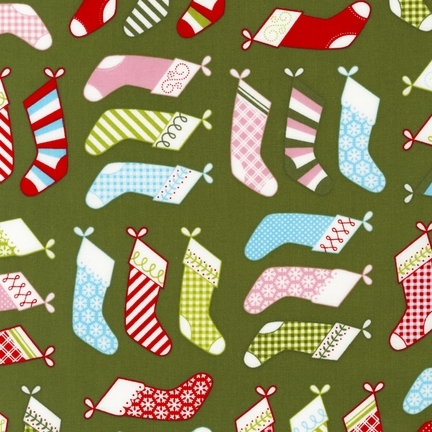 We love Christmas in July!! 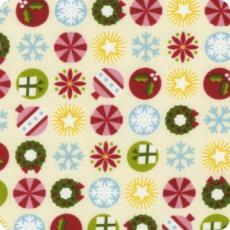 Next week we will be changing the shop around to feature all of our Christmas fabrics. Each week in July we will be featuring a new line with a project to do out of that line. 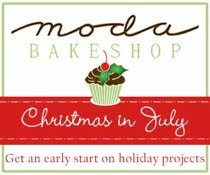 Moda Bake Shop is feeling the spirit also, so be sure and check them out for great projects too! I will be sending an email announcing that weeks featured line. 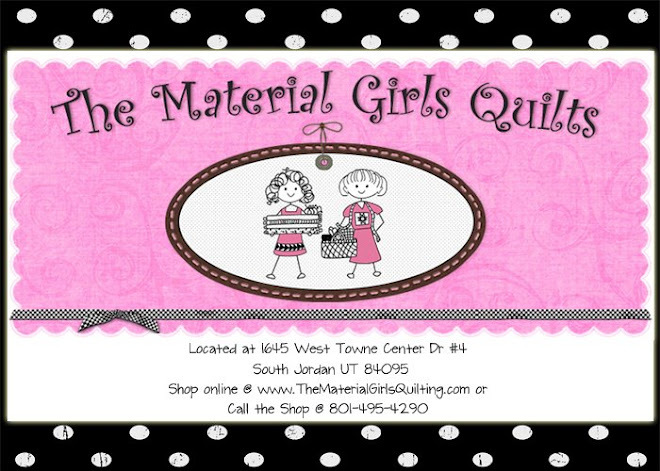 If you aren't on our mailing list be sure and sign up www.thematerialgirlsquilting.com So, come and Jingle through July with us! !